In case you missed it: When Season 17 of American Idol premiered after a long hiatus, it was only appropriate to open with the U.S. National Anthem, our glorious “Star Spangled Banner.” The choice of a singer wasn’t entirely expected though. As judges Lionel Richie, Katy Perry, and Luke Bryan stood to their feet and put their hand over their heart, a small, seven-year-old girl took the stage. Malea Emma Tjandrawidjaja became a viral singing sensation after she sang the U.S. National Anthem at a Major League Soccer game in September 2018. Malea Emma beat out hundreds of other contestants in an Instagram contest for the opportunity. At the soccer game, everyone was utterly shocked at the powerful voice that came out of such a tiny girl. After her performance, Malea Emma was asked to appear on ABC World News to be interviewed by David Muir the very same day. This caught host Ryan Seacrest’s attention, who in turn invited her onto his radio show On Air with Ryan Seacrest. Ryan also decided to call over to the American Idol producers and tell them all about this child phenomenon. Producers flew Malea Emma and her parents to Idaho to sing for the judges on the premiere of the American Idol season. 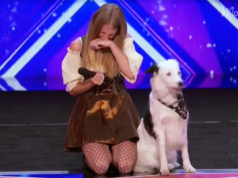 The judges thought the little girl was adorable, but they were utterly shocked when she opened her mouth and started singing the National Anthem. The judges were left with their jaws on the floor when a confident, fantastic voice came booming out of the little performer. Dressed in a cute floral dress and pink jacket, little Malea Emma stood confidently before them, and it was clear to see that this wasn’t her first time singing in front of an audience. Boldly, she belted out the problematic song, even the high notes at the end. Unlike most children her age, Malea Emma was in complete control of her voice and was pitch-perfect. She also added some impressive falsetto notes and unique ending to the famous song. Judge Luke Bryan exclaimed, “We’re getting outsung by a seven-year-old!” The judges were so impressed that they awarded the girl a Golden Ticket that would take her straight to Hollywood in 2027 since American Idol’s minimum contestant age is fifteen. At just seven years old, Malea Emma already has a Golden Ticket in her pocket waiting for her and is well on her way to becoming an incredibly talented singer. This girl is a natural-born singer for sure!